The prime ministers of Japan and the Czech Republic have had an unusual dinner companion as they met for a state dinner in Prague. A talking robot named Asimo walked into the dining room at the city's Hrzansky Palace and shook hands with the two leaders. The robot then said in Czech: "I have arrived in the Czech Republic, where the word robot was born, together with Prime Minister Koizumi as a Japanese envoy of goodwill." Asimo, the world's most advanced humanoid robot - can also speak Japanese as well as being able to walk upstairs and recognise voices. Japanese leader Junichiro Koizumi decided to bring the robot - made by the Japanese company Honda - as a tribute to the Czech writer Karel Capek. Capek invented the word "robot" in his 1921 play RUR (Rossum's Universal Robots), when he introduced the concept of human-like creations capable of doing dull repetitive tasks. 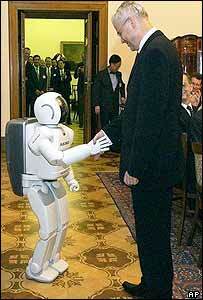 Robot comes from the Czech word robota, which means drudgery. As well as honouring their Czech hosts, the Japanese delegation were hoping Asimo (Advanced Step in Innovative Mobility) would provide light relief from the diplomatic purpose of Mr Koizumi's trip. The prime minister's two-day visit to the Czech Republic is the final stage of a week-long European tour, which has also seen him visit Poland and Germany. On Thursday, Mr Koizumi honoured victims of the 1968 invasion into the then Czechoslovakia by Soviet-led armies of the Warsaw Pact which crushed the liberal reforms in the country, known as the Prague Spring. Mr Koizumi and his Czech counterpart Vladimir Spidla are expected to discuss the effects of European Union enlargement. The Czech Republic is due to join the EU in May 2004. "Asimo is no gimmick, he's been developed as a mechanical home help"